This Mac setup does a great job of showing the opposite ends of the Apple spectrum here, with the large 27″ iMac sitting next to the tiny MacBook Air 11″ and an even smaller iPad and iPhone. According to the images Flickr page, the glowing Apple logo box above the iMac is a custom creation. 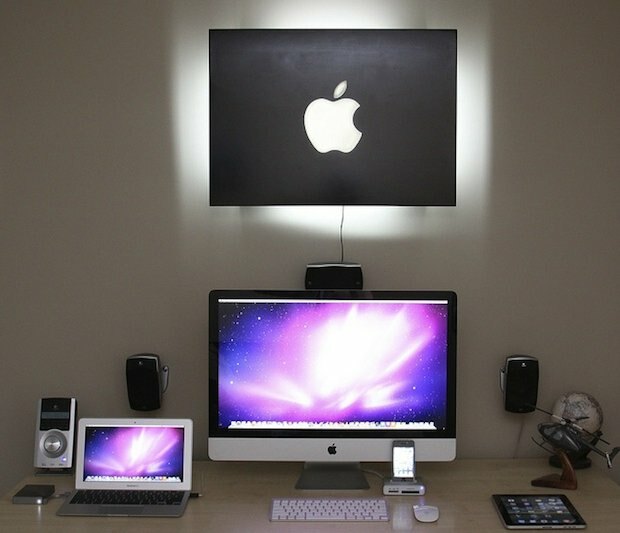 Round it all off with some wall mounted speakers, and you have a great Mac setup. That glowing logo is so cool! Love the MBA, love the iMac, love it all! Beautiful setup, if the MBP refresh disappointed I will get a MBA instead. Can you find a website for us that offer mac products like the Macbook Pro 15 and 17″ for a very cheap price, the newest versions? And how to setup a setup like this one too like Xavier said ?